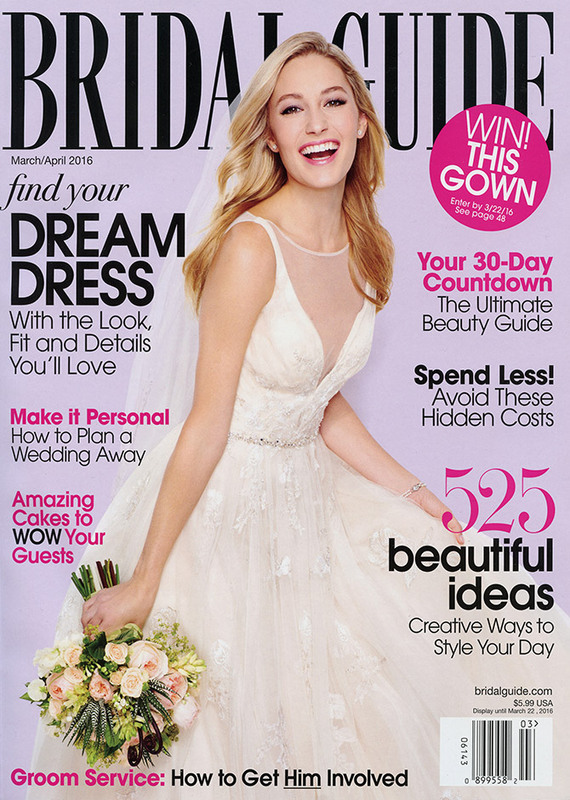 We are thrilled to announce that our photography from Jamie and Daniel’s Tiffany blue and carnival themed wedding at Calamigos Ranch in Malibu, CA is featured in the March/April issue of Bridal Guide magazine – on shelves now. 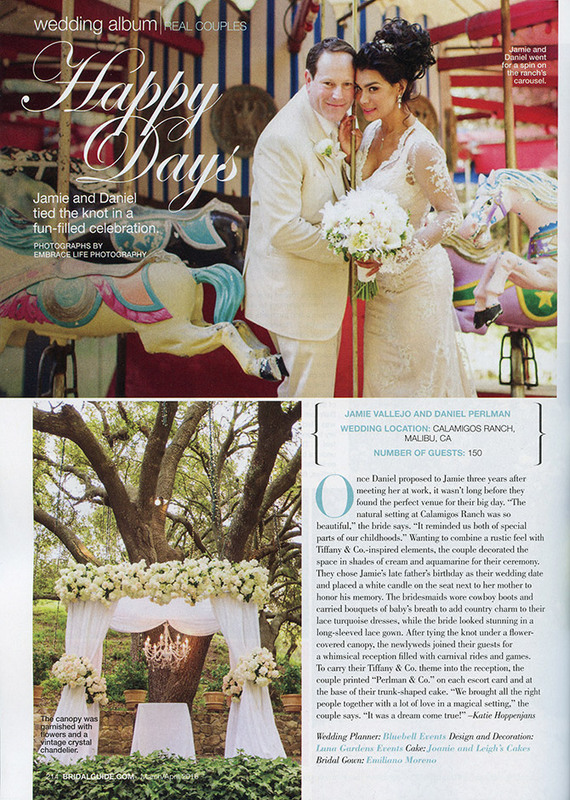 Calamigos was the perfect location for Jamie and Daniel’s beautiful, eclectic wedding. Getting married under the gorgeous oak tree at the Pavilion at North Point provided the romantic, elegant garden inspiration that was beautifully displayed at the wedding ceremony, while the carousel and ferris wheel supported the fun, carnival party vibe. 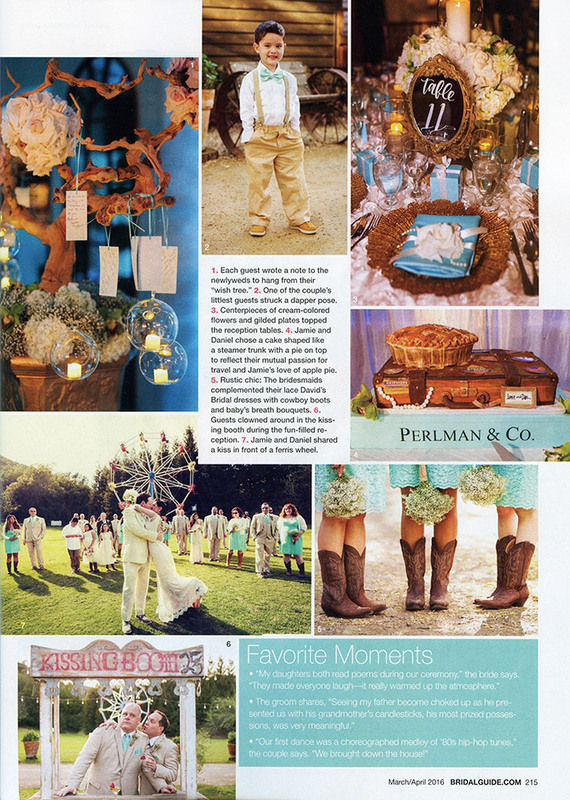 As the Bridal Guide magazine feature shows, some of the other interesting details include many Tiffany blue accents, including a very unique cake by Joanie and Leigh’s Cakes; fun lawn games including over-sized Jenga; face-painting and characters to entertain the children; a mariachi band that escorted guests from the ceremony site to the tented reception area; even a horse drawn carriage to help the bride and groom make a spectacular entrance. Our friends at Bluebell Events and Luna Gardens did a great job pulling it all together and producing a beautiful wedding that we loved to photograph.